“from now on I’m going to make some changes” to Jazz&Jazz! In 2010 I visited New Orleans with Southern Sounds for the French Quarter Festival. It was an experience I’ll never forget and a catalyst for developing and expanding Jazz&Jazz. 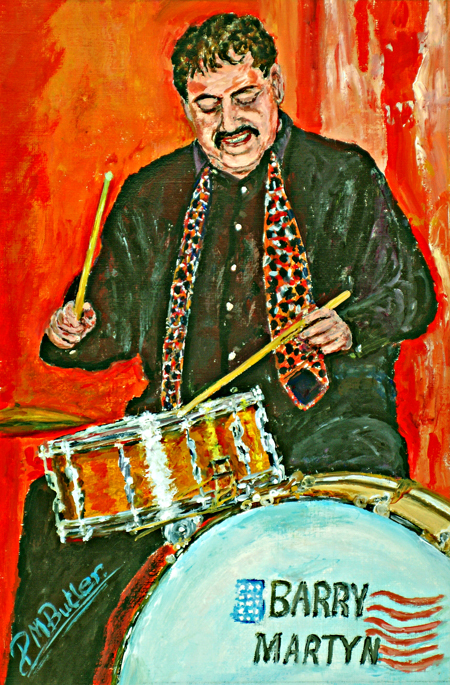 It got me deeper into jazz photography and painting jazz portraits. Imagine my delight in meeting stars such as Dr Michael White, Greg Stafford, Barry Martyn and Leroy Jones, and then painting their portraits. All because my wife Ginny won the star prize in the very last Ken Colyer Trust Annual Draw at the 2009 Hemsby Autumn Jazz Parade! So now its time for a rethink! Jazz Lamentations, “Peanuts and Poor Turnouts”? Let’s Up The Ante! So as of now, I’ve decided it’s time to get back to my original aims for Jazz&Jazz! For instance, there is a Jazz Revival! Numerous younger bands with growing numbers of enthusiastic young fans are making their mark. Older fans love them too and seize on opportunities to follow them. Jazz&Jazz features, films and hi-lights their live gigs at every opportunity. Search the site and you will find them. Requested Promotions – Permissible Exceptions! I am prepared to make certain exceptions to my decision not to promote “third party” events. For instance, if it’s considered that Jazz&Jazz – along with my peripheral Social Media links – has enough reach and impact to help promote such events, then I’ll consider featuring them on the site, with links to my Social Media pages. But as of now, only in return for contributions to cover costs and help with much needed financial support for Jazz&Jazz. There is a Donate Button in the right hand column of each Jazz&Jazz page! I receive no assistance in producing Jazz&Jazz, nor my Jazz&Jazz YouTubes or Social Media links. Definitively and promotionally, I am a One Man Band! So voluntary contributions, not charges, are always appreciated. I feature Jazz&Jazz YouTubes throughout this website. To date I have posted some 750 YouTubes and have close to 650 YouTube subscribers. I have a list of MP4s for future conversion as YouTubes. My YouTubes carry Google Advertising, essentially also to raise funds to help cover costs. But such income is limited and dependant on the length of time given to watching the ads. Much of jazz&jazz is due to be updated so, between handling the many posts, features and requests received, I aim to make changes and amends to the site as and when time permits. Facebook & A Final Plea! All manner of comments are made on all manner of posts. But they are there one minute and gone the next as they sink ever deeper into the Facebook vortex. It’s A Social Media Thing! At the foot of every post featured here on Jazz&Jazz is a “Speak Your Mind” section where you can post your comments and have your say. Not nearly enough fans use this facility but they comment frequently on the relative posts on Facebook. So please, get involved and use Jazz&Jazz “Speak Your Mind” rather than, or at least as well as commenting on Facebook. Then your points will be all the more meaningfull and relevant to jazz! Each in its place under the relevant topic for perpetuity rather than forever sinking lower and lower into the Facebook morass. Every Jazz&Jazz feature is shared on Facebook, Twitter and Linkedin, so all you have to do is link back to the source of the feature on Jazz&Jazz to add your “Speak Your Mind” comments. Others will then be able to respond to your comments. I support your aim of shifting more of the dialogue from Facebook to J&J, although I fear it may be an uphill battle! If you’ve got time, could you comment further on what constitutes a “third party event”. Keep up the good work – we need you! Thank you, Phil. I agree, encountering FB will not be easy. But I’ll endeavour to do so probably best with links back to Jazz&Jazz. Good point about “third party events” – it’s a catch all phrase referring mainly to requests received for promotions for instance from agencies. I will need to use discretion. It was good to see you again on Sunday. I’m not a regular user of the comments section on any forum, but my question is this : Is there a way you can improve the sound quality of the recordings you make? YouTube is, after all, a worldwide public platform. Anyone searching for a band on YouTube and finding one of your clips are getting something that is visually great, but aurally very mediocre unfortunately. It isn’t a great advert for any band to sound so thin and edgy. Maybe in the same way that you have a lens attachment for your mobile phone there is a similar thing microphone-wise? Thanks for the input, Wil. First such comment I’ve received as most times the sound is as well accepted as the the visual. I think the sound quality is much more down to the venue, better in some locations than others. Sound quality at clubs is nowhere near up to recording studios – but the YouTubes capture the atmosphere and even some fan repartee. Probably a microphone attachment would pick up even more club imperfections – and wouldn’t be easy to sync.